USB-C Card Reader Compatible with CF, SD and Micro SD Storage Cards Read and write data, images, and video directly from the 3-port card reader to your USB-C equipped Apple computers. Card reader is compatible with any USB-C or Thunderbolt 3™ ready computers as well as USB-C ready devices with OTG support for smartphones and tablets. It also comes with LED indicator which lights when in use. The three ports are designed to read or backup data from 10 different cards. Plug and Play with Fast Data Transfer Speeds There is no need to install any drivers; just plug the adapter into your computer and you are ready to go. Transfer images, videos, music and data from your digital camera or other devices up to 5Gbps. No Electromagnetic (EM) Interference Anodized aluminum design minimizes EM interference, for clear and compatible connection with no EM waves to disrupt your work on the computer. Fast Charge and Sync EZQuest’s USB-C Cable is designed using SuperSpeed USB 3.1 technology, which minimizes wait time for charging and syncing devices transferring files and data. With data transfer rates of 10 Gbps, the technology enables movies to be downloaded in a little over a minute. Power delivery of up to 100 watts and with smart power management extends battery life by providing higher bandwidth and greater power efficiency for quick charge. Bi-Directional Power Delivery Smart USB-C 3.1, Gen 2 technology provides intelligent and flexible power management enabling laptops to provide high power delivery to battery powered devices. Bi-directional power delivery means that the device with the power can provide power and data at the same time. This optimizes power management by allowing each device to take only the power it requires, and to get more power when required. Fast Streaming With a 10Gbps data transfer rate, real-time streaming is clear and uninterrupted. There is no wait time required. Reversible Connectors The USB-C connectors are designed to be reversible, so you don’t have to worry about which side of the connector is up when you plug in the cable. USB-IF Certified Compliance testing SuperSpeed+ USB certified means that this cable has been certified by USB-IF to meet all electrical, mechanical, and environmental standards, ensuring a superior user experience. USB-IF is a non-profit organization made up of companies that facilitate the development of high quality USB products and compliance testing. Stream Movies or Personal Videos to HDMI The EZQuest USB-C to HDMI 4K 60Hz (60 frames per second) 2-meter cable is our latest generation 4K solution that enables the output of ultra-high definition video and digital audio to your Ultra HD TV, monitor or projector. The latest advanced convertor chip-set provides a 60Hz refresh rate so you can enjoy crystal clear, blur-free video with multi-channel digital surround sound from the latest USB-C/Thunderbolt™ 3 Ready computers. Extend/Mirror Display The EZQuest USB-C/Thunderbolt™ 3 to HDMI 4K Cable enables the extension of the computer’s display screen to any HDMI-based display. The cable allows you to mirror your MacBook or MacBook Pro display to your HDMI-enabled TV or display in up to 1080p at 60Hz or UHD 4K at 60Hz. 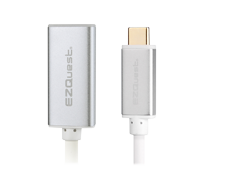 Anodized Aluminum Sleeve Design <EZQuest’s sleek cable design is precision-engineered with anodized aluminum sleeves on each end of the cable to minimize electromagnetic interference (EMI) from other nearby electronics for pristine picture quality. All-in-One Solution EZQuest’s durable cable combines the video and audio pass-through into one simple cable design. The 2 meter (6.6-foot-long) HDMI cable provides increased flexibility to extend the computer’s reach to HDMI-based TVs. USB-C/Thunderbolt™ 3 to HDMI 4K 60Hz Cable 2 Meter (6.6 Foot) Cable with Anodized Aluminum Sleeves. Stream Movies or Personal Videos to HDMI The EZQuest USB-C to HDMI 4K 60Hz (60 frames per second) 5-meter cable is our latest generation 4K solution that enables the output of ultra-high definition video and digital audio to your Ultra HD TV, monitor or projector. The latest advanced converter chip-set provides a 60Hz refresh rate so you can enjoy crystal clear, blur-free video with multi-channel digital surround sound from the latest USB-C/Thunderbolt™ 3 Ready computers. Extend/Mirror Display The EZQuest USB-C/Thunderbolt™ 3 to HDMI 4K Cable enables the extension of the computer’s display screen to any HDMI-based display. The cable allows you to mirror your MacBook or MacBook Pro display to your HDMI-enabled TV or display in up to 1080p at 60Hz or UHD 4K at 60Hz. 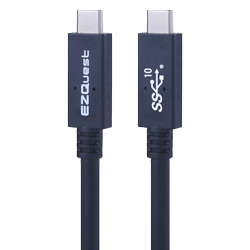 All-in-One Solution EZQuest’s durable cable combines the video and audio pass-through into one simple cable design. The 5 meter (16.4-foot-long) HDMI cable provides increased flexibility to extend the computer’s reach to HDMI-based TVs. USB-C/Thunderbolt™ 3 to HDMI 4K 60Hz Cable 5 Meter (16.4 Foot) Cable with Anodized Aluminum Sleeves. EZQuest’s design incorporates an extra chipset and added circuit board. Competitive products put the extra chipset and the board in between the USB-C and HDMI connectors, which creates extra a bulky piece in the center of the 16.4 feet cable. Our cable has it all in the HDMI connector circuit board for a clean design. Anodized Aluminum Sleeve Design EZQuest’s sleek cable design is precision-engineered with anodized aluminum sleeves on each end of the cable to minimize electromagnetic interference (EMI) from other nearby electronics for pristine picture quality. Stream Movies or Personal Videos to HDMI The EZQuest USB-C to HDMI 4K Adapter seamlessly connects to your MacBook and MacBook Pro USB-C port, USB-C ready computers or USB-C ready devices with OTG support for smartphones and tablets through HDMI cable for viewing any HDMI TV, monitors, and projectors. EZQuest’s USB-C to HDMI 4K Adapter supports 4K UHD, HDTV or HD display with digital sound on digital TV. Extend/Mirror Display The EZQuest USB-C/Thunderbolt™ 3 to HDMI 4K Adapter enables the extension of the computer’s display screen to any HDMI-based display. The adapter allows you to mirror your MacBook or MacBook Pro display to your HDMI-enabled TV or display in up to 1080p at 60 Hz or UHD (3840 by 2160) at 30 Hz. This feature expands the latest-designed Macs and Chromebook Pixels with a single USB Type-C port to have HDMI connectivity. 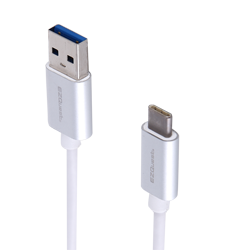 Anodized Aluminum Sleeve Design EZQuest’s sleek adapter design is precision-engineered with anodized aluminum casing on each end of the cable to minimize electromagnetic interference (EMI) from other nearby electronics. Charge USB-C Enabled Smartphones, Tablets or Laptops from Your Vehicle The EZQuest USB-C/USB Car Charger will let you charge your MacBook, MacBook Pro or any USB-C ready laptop while in your vehicle. Simple to Use Plug into your car’s 12- or 24-volt lighter outlet, and you are ready to charge. Connect your USB-C device, or any standard USB devices to be charged. An LED light shines signaling that you are receiving power and ready to charge. 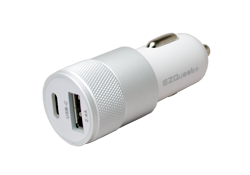 For Use with USB-C and USB Devices EZQuest’s USB-C/USB Car Charger is designed for both new and current technology. The USB-C port will charge your MacBook and MacBook Pro as well as any other USB-C ready devices. The standard USB Port will power your iPhone, iPad, iPod, and many more USB friendly devices. Built-in Circuit Protection Built-in circuit protection ensures that your device is protected at all times while charging. Connect a USB Device to Your New MacBook The EZQuest USB-C™/Thunderbolt™ 3 to USB-A Female Mini Adapter lets you connect your USB devices including a thumb/flash drive, mouse, keyboard, or printer to a New MacBook or USB-C™/Thunderbolt™ 3 ready computer. 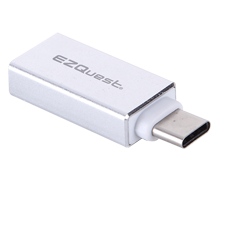 The EZQuest USB-C™/Thunderbolt™ 3 to USB-A Female Mini Adapter lets you charge/sync your iPhone, iPad, or smartphone to a USB-C™/Thunderbolt™ 3 ready MacBook, computer or other USB-C™/Thunderbolt™ 3 powered devices. Compatible with USB 3.0/2.0 and USB-C Ready Devices with OTG Now you can access information from your USB 3.0 hard drives and other devices. With this adapter, you can also connect to older peripherals that support USB 2.0, as well as USB-C ready devices with OTG support for smartphones and tablets. No Interference Anodized aluminum design minimizes EM interference, forclear and capable connection with no hassel of interference waves to disrupt you on your computer. 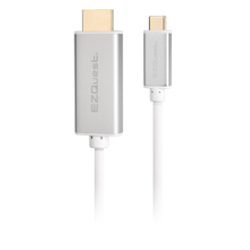 Charge Smart Device with Your Protective Case Still On EZQuest’s USB-C Female Mini Adapter is designed with a durable white PVC spacer that not only strengthens and protects the metal USB-C connector, but adds length so that smart devices can be charged without removing their protective cases. Connect a USB Device to Your New MacBook The EZQuest USB-C™/Thunderbolt™ 3 to USB-A Female Adapter lets you connect your USB devices including a mouse, keyboard, or printer to a New MacBook or USB-C™/Thunderbolt™ 3-ready computer. 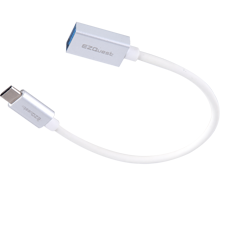 The EZQuest USB-C™/Thunderbolt™ 3 to USB-A Female Adapter lets you charge/sync your iPhone, iPad, or smartphone to a USB-C™/Thunderbolt™ 3 ready MacBook, computer or other USB-C™/Thunderbolt™ 3 powered devices. Compatible with USB 3.0/2.0 and USB-C Ready Devices with OTG Now you can access information from your USB 3.0 hard drives and other devices. With this adapter, you can also connect to older peripherals that support USB 2.0, as well as USB-C ready devices with OTG support for smartphones and tablets. No Interference With our anodized aluminum sleeves on both ends minimize EM interference. For clear and capable connect with no hassle of interference waves to disrupt you on your computer. 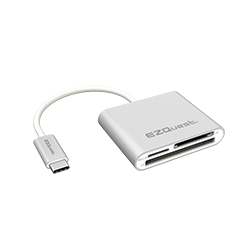 *EZQuest's USB-C™ to USB-A 3.0 Female Adapter is Thunderbolt 3™ port compatible. Connect a USB 3.0 External Hard Drive to Your USB-C Equipped MacBook The EZQuest USB-C™/Thunderbolt™ 3 to USB Cable lets you connect an external hard drive to access and transfer data to your MacBook. You can also use it for charging your USB-C™/Thunderbolt™ 3-ready computer via a USB wall charger, car charger, and even a power bank. Charge your MacBook or computer at home or on the go. Compatible with USB 3.0/2.0 and USB-C Ready Devices with OTG The USB-C™/Thunderbolt™ 3 to USB Cable lets you connect your USB 3.0 hard drives and other USB devices. With this cable, you can also connect to older peripherals that support USB 2.0, as well as USB-C ready devices with OTG support for smartphones and tablets. Charge with What You Have If you already own a USB 3.0 or 2.0 wall charger, car charger or power bank, you can use them with the USB-C™/Thunderbolt™ 3 to USB Cable to charge your new MacBook or USB 3.0- or 2.0-compatible computer on the go or at home.